South Philly's Hammerin' Hank Lundy is eager for a shot at the world championship. The irrepressible and exciting junior welterweight, 23-3-1, 11 KOs, topped Olusegun Ajose in his last bout, which thrust him right back in the hunt for a world title shot, after two consecutive points losses had temporarily derailed his momentum. The wild-driving Lundy-Train heads to Resorts Casino in Atlantic City on Saturday night for a main event bout promoted by CES Boxing. Lundy expects to roll right through his yet to be named opponent in AC, and hopes to stay on track for a collision with his good friend Danny Garcia, the top dog at 140 pounds. Lundy is currently ranked #3 by the WBC, one of the belts currently held by Garcia. "We are cool, good friends," Lundy said of champ Danny Garcia. "It's not like I'm dying to fight him. It's just that the thing at stake is that world title, and that's what I want. That's what makes me want it (the fight) so bad. Being as though that he is the champ, that's the only reason why I want to fight him. If he didn't have the belt, I'd pay it no mind. But he has the world title, and he's in my way. So all due to that, I want to fight him." Garcia has stated publicly that he will have one more fight at junior welterweight, before moving up to 147, to chase bigger prey. That quote gave Philadelphia fight fans some hope that Garcia would give Lundy that last shot at his junior welter titles. However, with Garcia's recent huge wins over stars Lucas Matthysse, Amir Khan, Zab Judah and Erik Morales, such an all-Philly title war may not be in the cards. Forget the promotional nightmares that exist. At the moment, Lundy may not have the profile needed to land a fight with the budding mega-star. "Well, that would definitely put Philly back on the map," Lundy said. "You got two Philly guys, at the top of their game, in the same city, and bringing a world title fight back to Philadelphia. It'll be good. A lot of people are not for the Philly vs. Philly thing, but at the end of the day, you've got two top guys that want to be great and add names to their legacy to be even greater. So I figure a fight like that would be excellent. Like I told everybody. No disrespect. No harm done to Danny Garcia. He's a true friend, a real good guy, you know? I came up with him. We have true respect for each other." For now, Lundy will have to settle for his foe on Saturday night. Originally Jeremy Bryan was scheduled to fight Hank, but his recent pull-out has left the promoter on a search for a new opponent for Lundy. But the late change doesn't fluster Lundy. "I'm right on point. I'm ready to go," Lundy said. "You know, first and foremost, Team Hammer, we bring in all types of sparring that will have us prepared for anything that may show up in that ring. Team Hammer will be ready regardless. We don't base camp on one fighter. We bring in all types of styles, and we adjust when we get in the ring. That's what makes a great fighter, make adjustments in the fight, adapt, and finish up strong. Maybe ultimately get the guy out of there." Lundy has been close to a title shot before, but lost his place in line due to an unexpected defeat. But this time, he's determined to stay on track. "My motivation is still there," Lundy said. "It's never less. At the end of the day, you're still going in there with a man, and that man is liable to do anything in that ring. So my mindset and my focus is still the same. I'm still treating this fight like it's a world title fight. And this guy is standing in my way to get to that world title fight." If Lundy can win big on Saturday, perhaps he'll win the lottery and land that shot with Garcia. But if it doesn't happen, Lundy is ready to face anyone, anytime for the 140-pound world title. "If Danny's going to move up to 147, I commend him," Lundy said. "Right now, my goal is to be a champ at 140. We're set for a fight for a world title, and that's what's going to happen. After this fight, that's what we're looking for, to fight for a world title. We're ready. I have the right people around me now. So hey, let's cash in and do what we gotta do to become world champ." 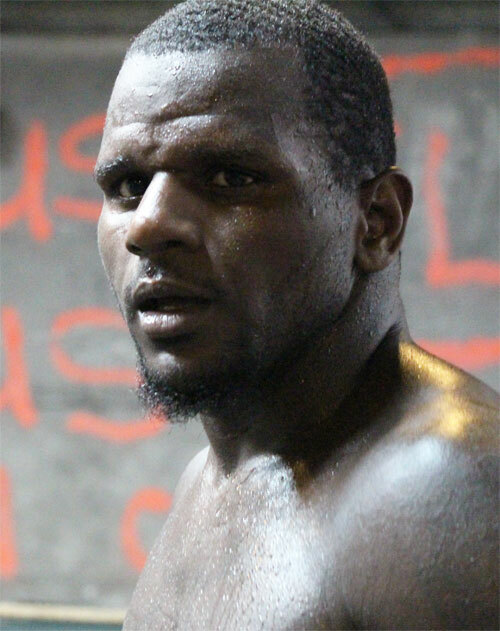 Lundy, who recently signed with manager James Prince, came close to fighting Lucas Matthysse last year. If he had the chance, Hank would jump at another opportunity to get in the ring with the Argentine puncher, who recently dropped a decision to Garcia in September. "When me and him were scheduled to fight," Lundy said. "You know, I believe I would have beat the brakes off him and knocked him out. Danny's a good friend. I take nothing away from Danny Garcia. Philly's champ. He did an excellent job (against Matthysse), but I feel as though I have more tools. I feel as though I still want to fight Matthysse. I would have stopped him and embarrassed him. Just like the fight with Ajose. Matthysse and Ajose had a war, and I got in there and made Ajose look like he didn't belong in the ring with me." The Lundy-Train stops in Atlantic City this weekend, and the next stop after that may just be at the top of the junior welterweight division.